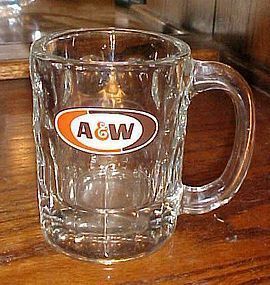 VIntage A&W Rootbeer mug oval logo circa 1968 4 1/4"
A & W Root Beer glass mug made of thick heavy glass. Oval logo circa 1968. Nice and clear, no chips or damages, Logo nice and crisp. 2 available. Great nostalgic advertising collectible. Height approx. 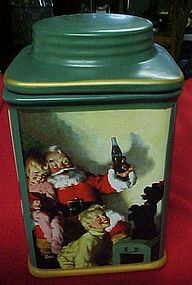 4.25"
Large musical ceramic Classic Coca Cola can cookie jar 2000 11"
Made of ceramic and is a licenced Coke product. Musical in the lid so when you take the lid off it plays. Measures over 11" tall and has a diameter of 6 1/2". 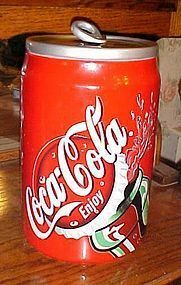 Year 2000 Classic original Coca Cola. Perfect condition with no damages. I see these but none of them has music in the lid like this one. 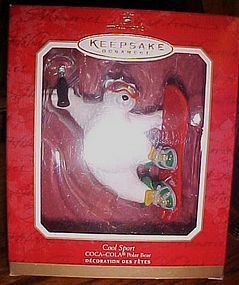 2001 Hallmark Keepsake Ornament, Coca Cola, Cool Sport Polar Bear. Dated 2001. It is new in the box with the original packing and has never been displayed. QHB9002. THis snowboarding bear looks very cool snowboarding with a bottle of coca Cola in his hand. 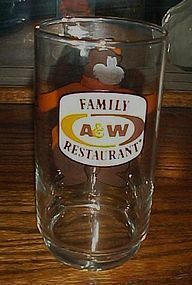 Very Nice, Vintage, A & W Restaurant, "The Great Root Bear", Glass Tumbler. This Outstanding Drinking Glass measures Approximately 5 3/4" tall x 2 7/8" diameter. 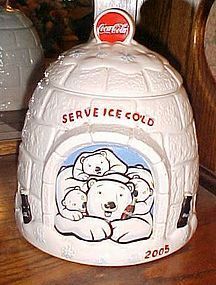 It depicts the Bear on one side, with the "A & W Family Restaurant" logo on the reverse. Condition is Excellent, with no chips, cracks, breaks, or repairs. I have 4 available. price is for each, and all are like new. 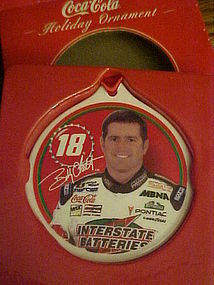 Ceramic holiday ornament with Bobby Labonte #18 on it. The one you will be getting is still new in the box, the box has light wear. The ornament itself is about 3 inches in diameter. This is in like new condition. Sakura Green Stoneware with gold toned trim. 6 3/4" tall. 4" Square base. Round handled square lid comes off.Cookie jar or canister. 2002 Coca Cola Company. Dishwasher and Microwave SAFE. Excellent clean condition, No cracks or chips. 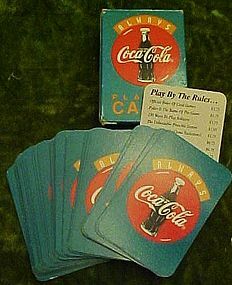 Cute and colletible deck of mini Coca Cola playing cards 1 5/8" x 2", by United States playing card co. 1996 featuring the "Always Coca Cola" logo. Pokeno instructions included. Cards are all excellent but box has wear on edges, and corner bumps. 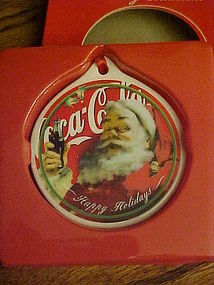 Nice addition for the coke collector or general card collector. 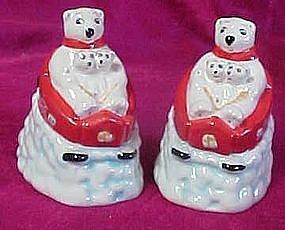 Coca Cola Polar Bear Ornament round shaped ball style shows polar bears all sitting and holding a coke bottle. 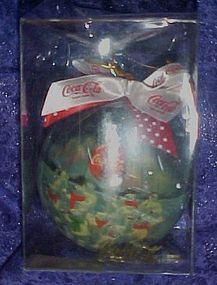 Red and white bow, says Coca Cola, and ornament is in the original plastic box. Box is bent out of shape, but ornament is perfect. This is the real deal collectors!! 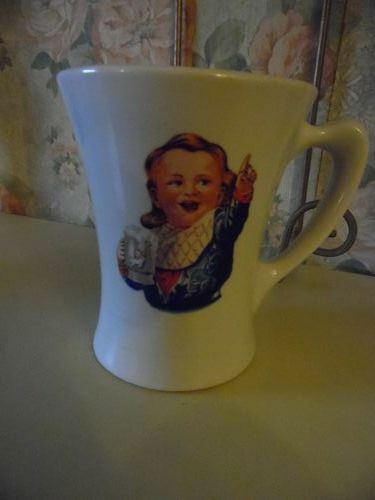 Original 1890's soda fountain mug with the Hires boy on the front, and HIRES spelled out on the back. These are being reproduced, but you can compare with this one and see this is the real MCCoy. Measures 4 1/8" tall and is in good condition with one chip repair. Amazing condition for these mugs to be in, if you are lucky enough to even find one! I have another identical one that is PERFECT. See my catalog. This is the real deal collectors!! 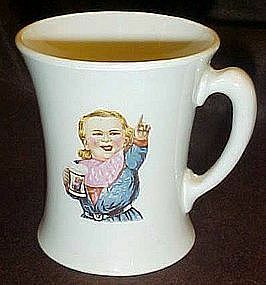 Original 1890's soda fountain mug with the Hires boy on the front, and HIRES spelled out on the back. These are being reproduced, but you can compare with this one and see this is the real MCCoy. Measures 4 1/8" tall and is in PERFECT condition with no chips or cracks. Amazing condition for these mugs to be in, if you are lucky enough to even find one! I have another identical with with a small chip repair I will be listing also. 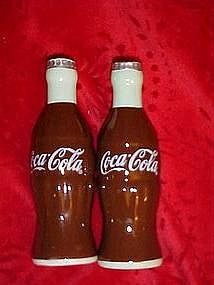 This pair of Coca Cola bottles shakers are made of ceramic, are hand painted and measure 5" tall. Plastic stoppers in the bottom. I don't believe these are an official licenced product. Excellent condition, newer. Two pair available. 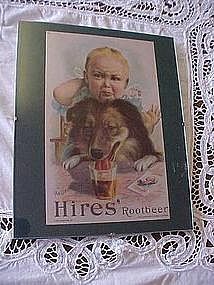 Hires rootbeer add titled Uninvited guest. All glass frame, measures 8X10. 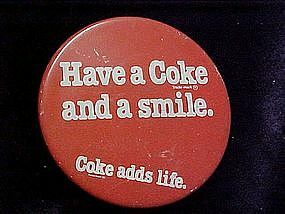 Coca Cola pin back button, with the slogan Have a coke and a smile,Coke adds life. lightly scarred, Measures 2 1/4". Advertising pin back button for Pepsi Cola. 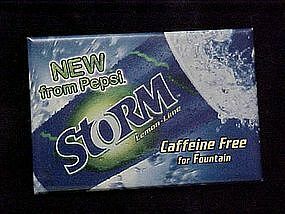 Storm lemon lime, Caffeine free for fountain. Very nice condition, and measures 2 1/4" by 3 1/4" retangular with pin back.